A Will to Serve: Cambodia! Very sorry for my delay in updating the blog. The past few weeks have been crazy. Here is just one reason why! A few weeks ago my boss, Stephen, came into the office and told me I would have the week off. Great, right? The small boat that the Mission uses each day to go out and visit seafarers in the anchorage was going into the shop for repairs and a new paint job. The work would take a few days so Stephen told me I should go on a trip. So that's exactly what I did! Missionaries need vacation too, right? Since I arrived in Asia, almost a year ago, I have always wanted to make a trip to Cambodia to see the ancient temples of Angkor Wat. The temples, vestiges of an empire that once boasted a million people, always fascinated me. How were they built? What were they for? What did Lara Croft really find underneath all of them? I had to find out. 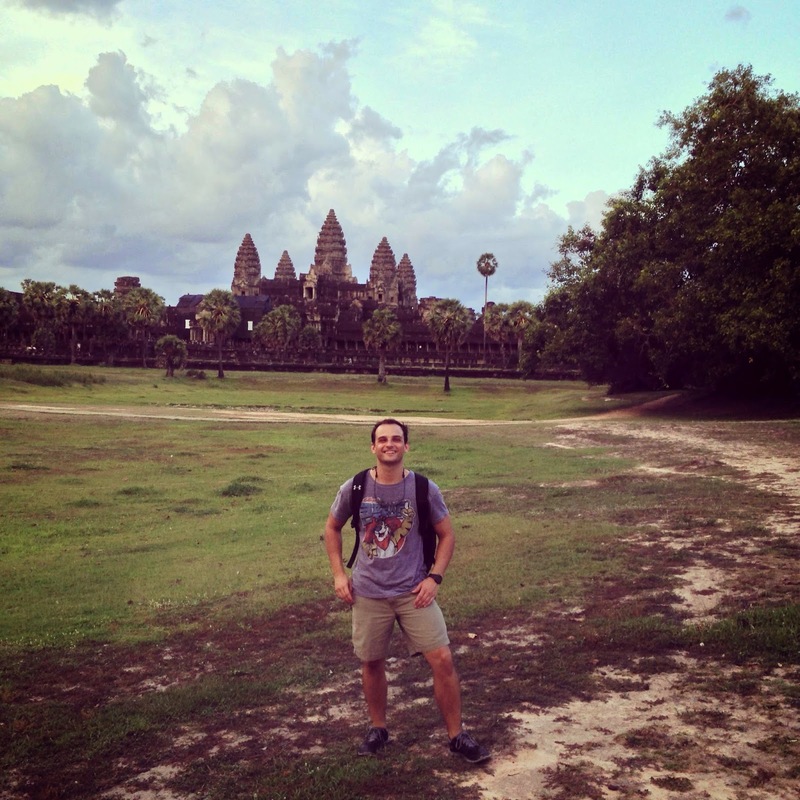 An extremely sweat yet happy Will in front of Angkor Wat. 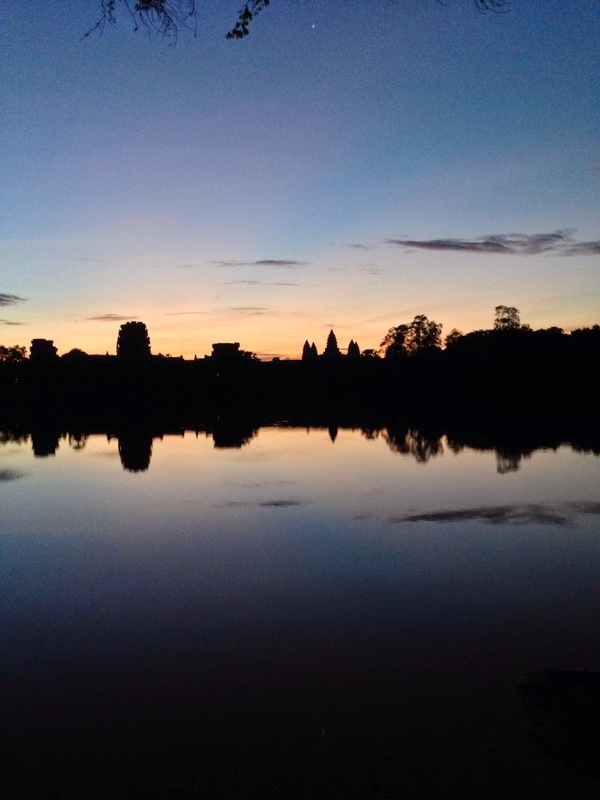 Angkor Wat sunrise the next morning. Caught the reflection from the moat surrounding the temples. 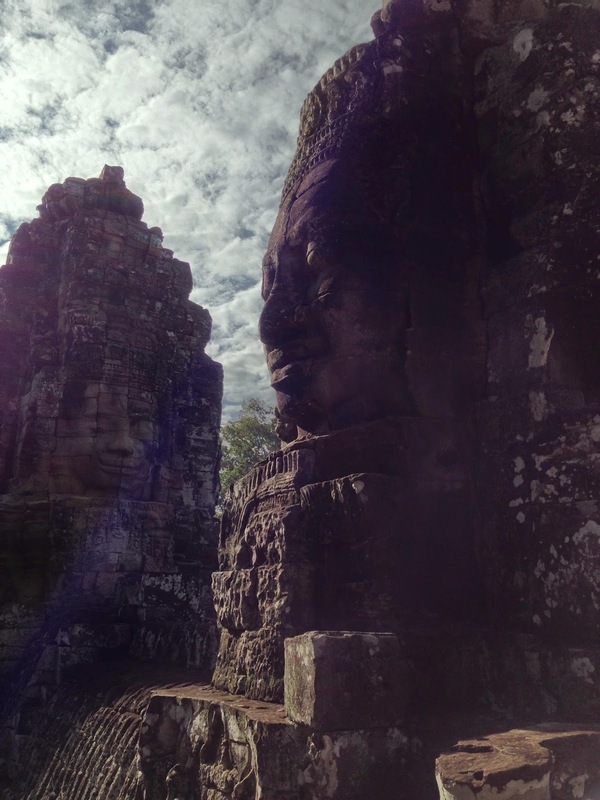 Faces from Bayon, another beautiful temple in the complex. The temples were beautiful and covered in intricate carvings. It is hard to describe the calm and peace I found there. At the times I went - early in the morning or just before sunset - I often had some of the temples to myself. Those were some of my favorite moments. One of the things I love about religion and spirituality is that people have always needed it and searched for ways to express their love of it. Disregarding any one religion, humans have constructed beautiful and amazing things to honor a supreme being or power in the universe. 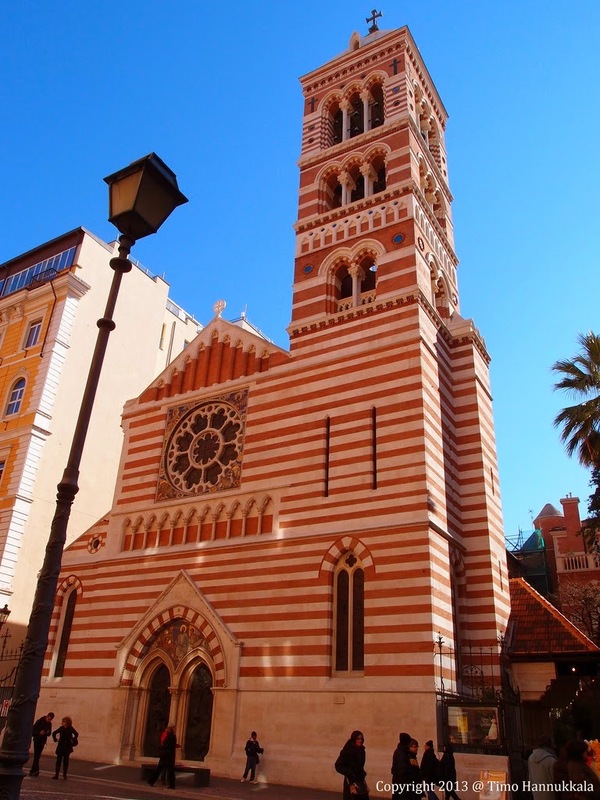 Think about the Hagia Sophia, Salisbury Cathedral, Wrigley Field, etc. Angkor Wat is no exception. The temple complexes are an amazing offering to God (or rather, a group of Gods), and serve as a reminder that people have always placed an extremely high value on the buildings they use to worship God. This is as true today as it was a thousand years ago. 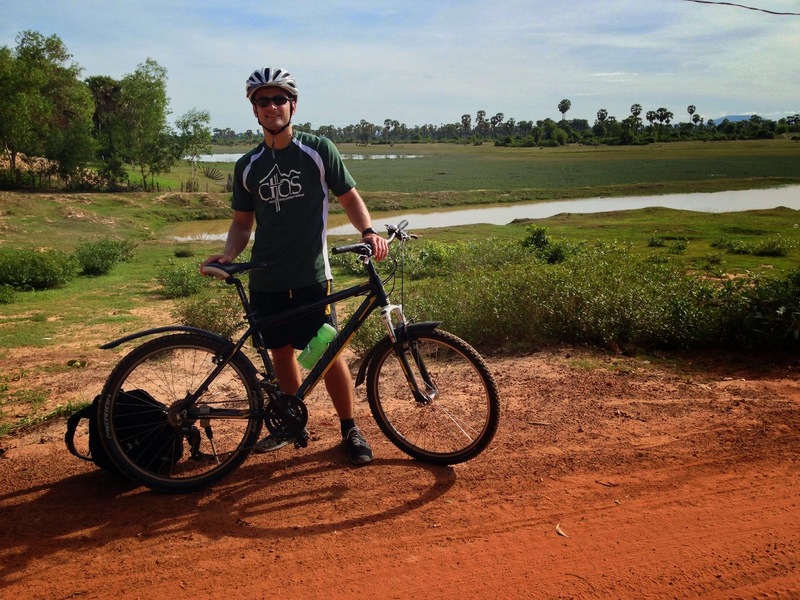 Aside from touring temples, I also went on a bike ride through the Cambodian Countryside. This was an unbelievable experience, as went nearly 40 miles through some of the prettiest landscape I have ever seen. Rice paddies, jungle, fishing villages. It was truly sensory overload. Thankfully, I was the only person on my tour so I got to ask the tour guide a lot of questions without worrying about sounding completely stupid. Praise! Taking a water break. Phew! It was SWELTERING. One of the many rice fields I passed on my tour. Posing outside of Bang Mealea. One of the more remote and unpreserved temples. Bringing whole new meaning to "Jungle Gym." Cambodia is an amazing place. It has beautiful temples, amazing food and very friendly people. But Cambodia also has a very dark history. 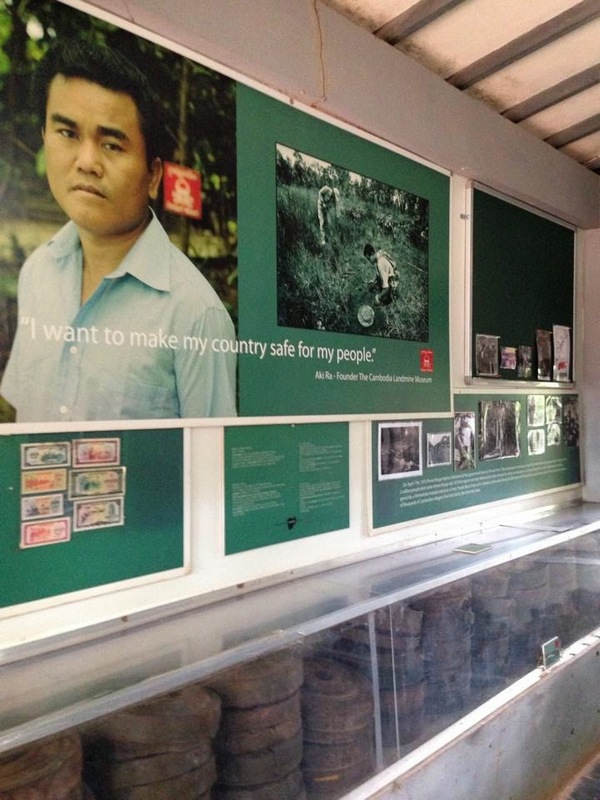 On my last day in Siem Reap, I traveled to the Cambodia Land Mine Museum which was probably one of the more emotional and moving museums that I have ever visited. 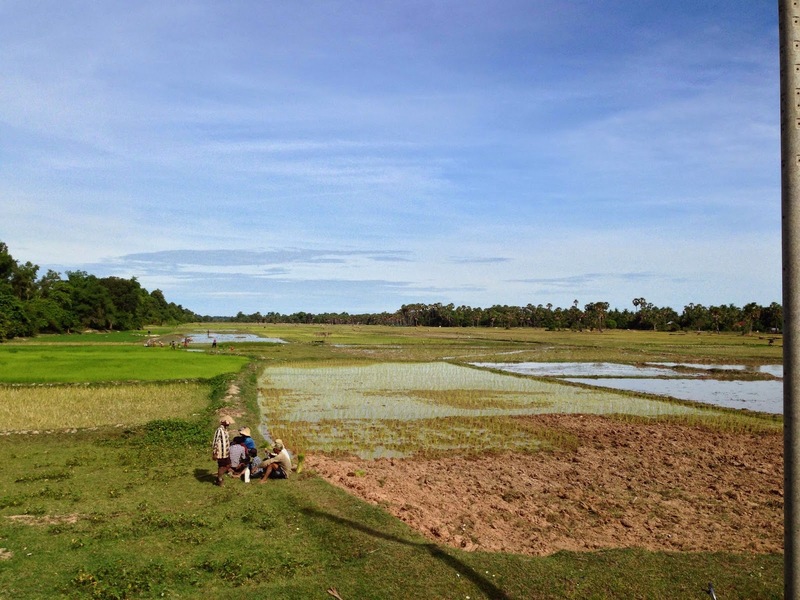 In the 1970s and 1980s, Cambodia was rocked first by a genocide and then by a civil war. Millions of people died during those times and, to an extent, the country is still recovering from the fighting that occurred there. One of the weapons that was used during the civil war in Cambodia was the land mine. Millions were planted in the countryside, but no maps were made as to where the mines were planted. The result of this is that there are to this day still an estimated 5 million unexploded land mines in Cambodia. Thousands of people have already been killed or severely maimed by these deadly weapons. 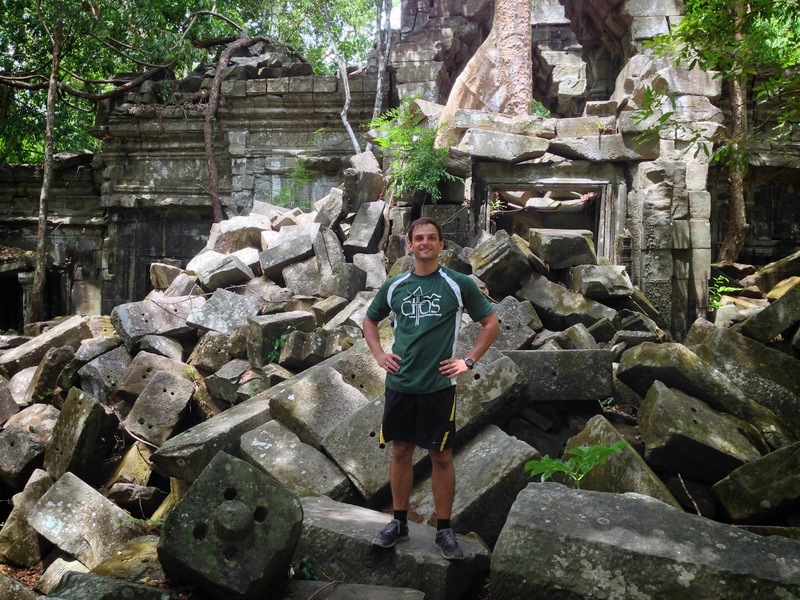 During my time in Cambodia, it wasn't uncommon to come across a large stretch of jungle that was covered in signs saying "Do Not Enter - MINE FIELD!" It was a shock to see that living with land mines was an ordinary way of life for the people in Cambodia. 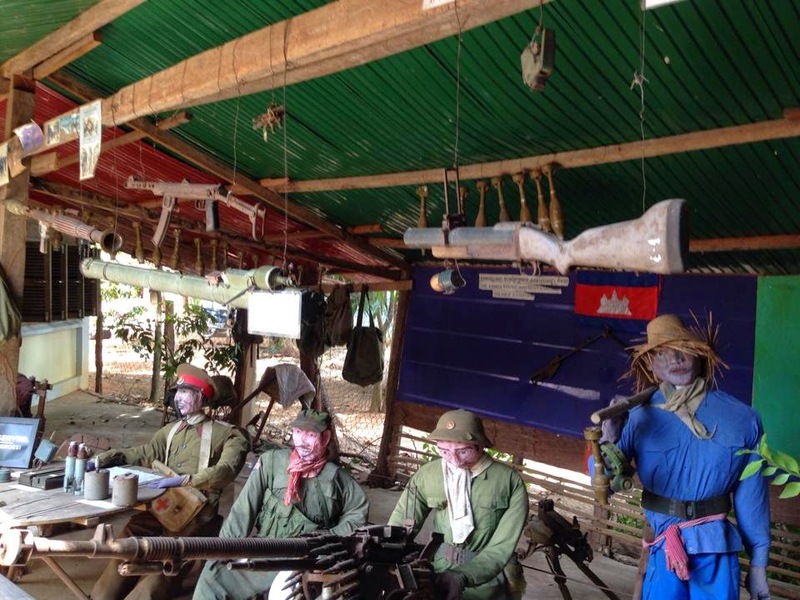 The Land mine Museum in Cambodia did a really excellent job of explaining the conflicts that plagued Cambodia in later half the of the 20th century. It also did a great job of showing the weapons that were used during that time. Aki Ra, a former child soldier runs the museum, and has spent his life disarming land mines and helping those who were afflicted. He was a CNN Hero in 2010 for the work he has done for his country. 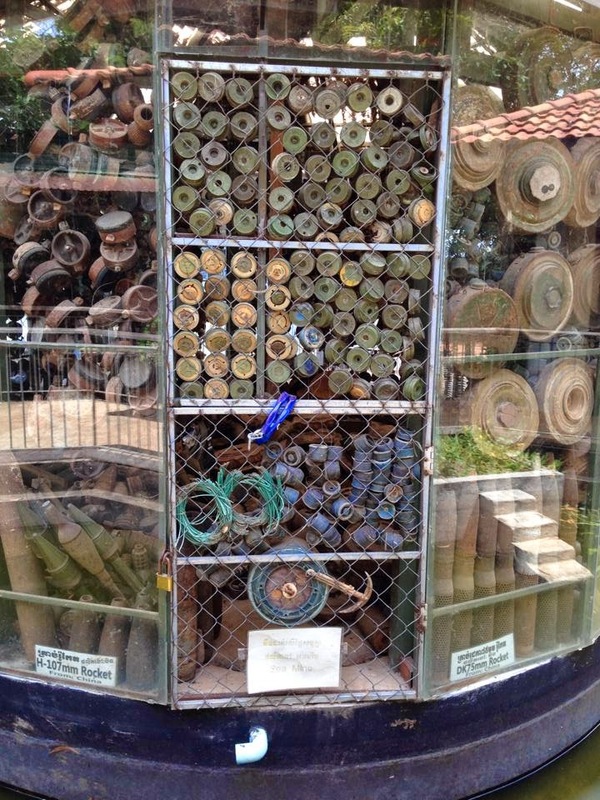 Anti-tank mines on display at the Land mine Museum. Different weapons and uniforms given to soldiers in the 70s & 80s. 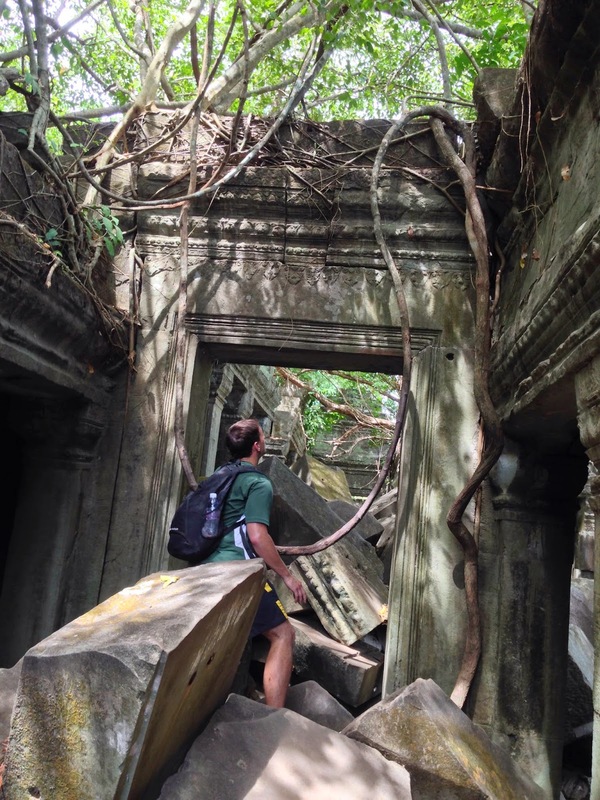 Overall, my trip to Cambodia was perfect. I am so thankful that I was given the opportunity to travel to this amazing spiritual capital. It was nice to get away from the hectic crunch of Hong Kong to the peace and quiet of the jungle. It was also nice to have some time for reflection on my mission thus far and prepare myself for the last month ahead. I can't believe I have less than a month in this amazing city. I've got a few things left to do before I check out of the Mariners' Club. I'll be writing another update shortly.